In my review of Olsen Perri Sta. Rita Hills (Hilliard Bruce Vineyard) 2014 Pinot Noir I went over Olsen Perri's origin story and how they do things. But here's a quote straight from the horses mouth, owner Mark Olsen: "Will Perri and I are both in our late 30s, each with young families. We share an addiction to Central Coast Pinot Noir and Chardonnay. It started small and easy to manage, but grew into a way of life. Drink wine, meet friends who make wine, buy fruit from these amazing folks, make wine, repeat. In the process we get to share the experiences with our friends, family and customers. Life is good!" So I know you're used to me going off on tangents or getting completely side-tracked sometimes but I really can't write long article-length reviews anymore. If you'd like to see why then you can read my announcement on it and why I'm putting off accepting more samples for awhile. But all you really need to know is that I'm gonna try and cut down on the amount of time spent writing wine reviews and still continue to keep, what @TheWiningHour on Twitter calls, #WineStalkerStyle. So you may see some experimenting on how I write reviews. So enough about that. Let's review a wine. Olsen Perri's L'Apache Pinot Noir may say Central Coast on the bottle but it's actually Santa Barbara County AVA juice. I have no idea why it's declassified on the label. The Pinot is of the Dijon 777 Clone and Pommard Clone. Native fermentation was used, like all of Olsen Perri's wines, and it spent ten months in 40% new French oak. It has a 13.4% ABV, only 92 cases were produced, and the label is one of the coolest that I've seen in a really long time. The color of the wine is a purplish-red with the clarity of... well, pretty much water. The nose starts off with an aroma sucker punch of violets, followed up with chocolate covered strawberries and incense. In the mouth it's light bodied, high in acidity, and low in tannin. There's flavors of tart cherries, strawberries and just a tiny taste of dirt. Nomnomnom! Frickin' yummy! 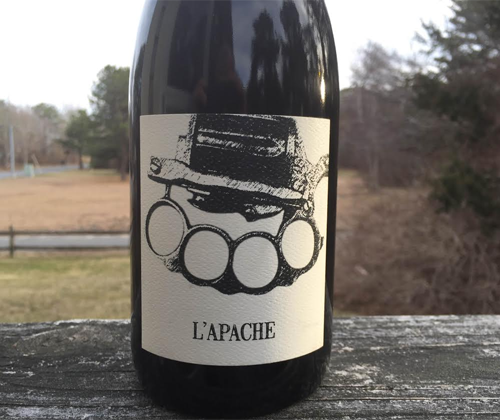 The L'Apache Pinot Noir is light, dry, tart and more for acidity monsters while their Sta. Rita Hills Pinot Noir is medium-bodied, savory and has some sweetness. Two completely different styles. But both are delicious, both are $45, and both get a 4 out of 5 in price vs. quality so I recommend them both for the money they'll cost you... but I actually liked the L'Apache more. It's more like what I personally look for in a Pinot Noir.